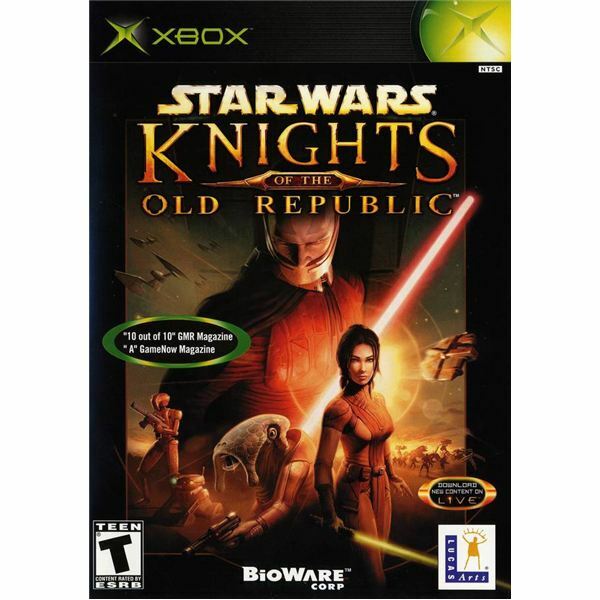 It’s been roughly five years since BioWare released their first console roleplaying game, Star Wars: Knights of the Old Republic, for the Microsoft Xbox, and it still remains the developer’s most successful and highest quality non-PC title to date. Long had video game fans and Star Wars enthusiasts craved the opportunity to immerse themselves in a lengthy, epic RPG set in George Lucas’s beloved sci-fi universe, and though many thought it impossible, the finished product actually lived up to the hype and anticipation. In this review, we take a look back at this Xbox classic. Visually, the game was most impressive, and it still holds up well today considering it runs on what is essentially outdated hardware. The various races of the Star Wars universe are all well represented here, with the character designs of the many playable and non-playable characters alike sporting incredible detail. The music isn’t bad either, though it’s a shame that only the main theme from the movies made the soundtrack. More of John Williams fantastic work would have been greatly appreciated, especially his work on the original film trilogy. Still, I guess that’s a relatively minor complaint, all things considered. On the plus side, there is plenty of voice acting in the game, and all of it is of the highest quality. Small gripes aside, this game spots some top-notch production values. BioWare’s goal in developing this game was to mix the combat engine they used in their critically acclaimed PC titles like Baldur’s Gate and meld it with the turn-based battles that console gamers were more familiar with. The result is an engine that utilizes round, which act like turns, but are timed and allow both the player’s party and their opponents to attack and react in real time. Other BioWare staples, such as the long branching conversation trees, the ability to complete missions in a number of ways, and the character’s behavior affecting the story and eventual outcome of the game, are present in full force. Choosing behind the light side of the force and the dark side, and being rewarded with different plot developments as a result, was new and exciting for console gaming fans at the time, even if other titles (Fable 2) have since duplicated the feat. All in all, Knights of the Old Republic is far deeper in these departments than most other console RPGs of its era. Personally, I’m not a huge fan of the battle system. I would’ve much preferred they either made it completely turn-based or completely action-oriented, but I suppose that’s a matter of personal taste. Set thousands of years before the original movies, Knights of the Old Republic sees the Sith, led by the sinister Darth Malak, launching an offensive against the Jedi and the Republic. As the game opens, the main character (who can be male or female, and a member of any one of several races) is on board a ship that is being assaulted by Malak’s forces. He or she manages to escape to the planet Taris, where he or she gains some allies, and eventually meets up with the Jedi Council and is taken into their order. Along the way, the protagonist learns much more about Darth Malak, as well as the Sith Lord’s missing former master, Darth Revan. There are plenty of side quests and plot twists to be had, and ultimately, the player is faced with a difficult decision. Do you save the Jedi through your actions, or join with the Sith and help eradicate them? Regardless of the path chosen, this game weaves one phenomenal tale from start to finish. Star Wars: Knights of the Old Republic is an immensely deep roleplaying game that is set in the universe of one of the most beloved film franchises of all time. It included a number of features console RPG fans had rarely had the honor of experiencing, such as the branching conversations and the ability to influence how events unfold by your actions. Considering all that, it’s easy to recommend this game, especially to Star Wars fanatics and RPG fans looking for something a little out of the ordinary. While I still maintain the combat system could’ve been better, the graphics and otherwise solid gameplay make this undoubtedly the top roleplaying game available on the original Xbox. Check out these other reviews for both the first and second Star Wars Knights of the Old Republic. Star Wars Knights of The Old Republic vs. KoTOR 2: Which Is Better?